Welcome to the members section. 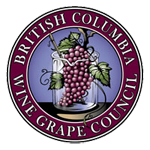 If you are a Member in Good Standing of the BC Wine Grape Council you can login to this area to report your grape tonnage, access confidential reports and project updates. Members in Good Standing are determined by their levy payment status. If you are a winery and have reported your tonnage and paid your levy for the last vintage you are in Good Standing. If you are a vineyard owner and the winery in which you sold grapes to has reported their purchase from you and paid their levy invoice then you are a Member in Good Standing. If you are unsure if you are a Member in Good Standing please contact Kate Durisek, info@bcwgc.org.